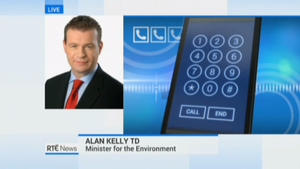 Environment Minister Alan Kelly, who is on holiday, spoke to Sharon Ní Bheoláin on RTE’s Six One last night via telephone, following the Eurostat/Irish Water/Exchequer balance sheet brouhaha. 1. There has been ‘considerable government control’ over the body, and especially in regards to board appointments and ‘pricing parameters’. 2. Irish Water ‘merely re-organises previously non-market activity carried out by local government, with local government assets being transferred to Irish Water and a large majority of Irish Water staff remaining local government employees’. 3. There has been ‘significant and continuous government funding and support to Irish Water’. 4. A ‘lack of economically significant prices, concerning in particular the capping of fees for households’. 5. The so-called ‘50% test’ – where sales cover at least 50 per cent of the production costs over a sustained multi-year period – has not been met. Further to this, Mr Kelly said Eurostat’s decision would make no impact at all. 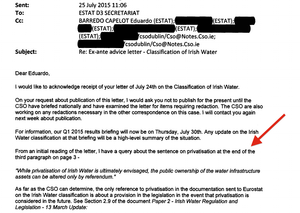 Posted in Misc and tagged Alan Kelly, Eurostat, Irish Water, Six One at 7:10 am on July 29, 2015 by Broadsheet. He’s got a point you know. They paid for the metres with our pensions and then reinvented the census. Granted, they tried to set-up a company with 4million customers in less than two years, but we were compelled to install the metres by 2015 as per the Water Directive. And now we won’t metre for people washing their cars and driveways and watering their gardens but continue to pay for two administrations and capital investment for infrastructure. I’m feeling very bedded down, thank you. He is a born liar. He has got no points. 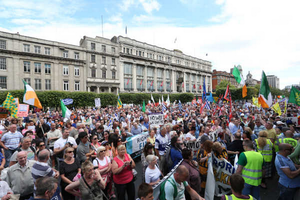 irish water wanted to impose a standing charge, the government over ruled this. kelly is happy with 45% compliance, yet he know eurostat needed 50%. Basically, all irish water has achieved is to add very expensive layer after layer of management above the old local authority structures, a classic quango. Kelly is incompetent and doesn’t posess the skills to run a tap, never mine a government ministry. John Tierney has a career littered with failures and totally lacking in successes, why would iw be any different? What the govt have delivered is a tax collecting department, nothing more, nothing less. If you need any further proof of incompetence, have a listen to Paudie Coffey on RTE this mornng, the man is a liar, a fraud and a total embarassment. this reminds me of the Dam Busters and the first cracks are now showing. 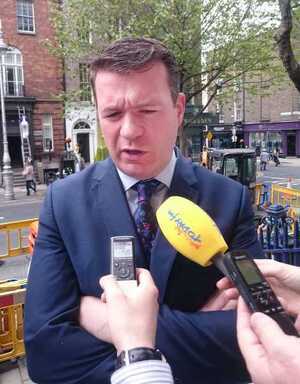 Deny deny deny deny deny – Alan Kelly’s thought structure. You are probably right. We are lucky he didn’t just start talking about his holiday. Must start playing broadsheet bingo. Why was my comment moderated out of existence? nice use of omnishambles, in fairness. +1, deftly lobbed nicely in there. Love that its leaking into real life politics. Ah yes. It’s Alan “I wouldn’t agree with that at all” Kelly. Has there been a figure yet for how much cash Kelly’s decision has cost the citizens? His legacy you ask – compliance like good Europeans. The CSO can look at all the figures they want, Eurostat will just tell them to toddle on and go back to playing with monopoly money like good lads and lasses. As for “This has no impact whatsoever.” that pretty much sums up this governments approach to running this country, no idea what they are at and bury the head in the sand when it all gets to much. and this joker wants to become leader of The Labour Party! Get rid of him now before he does any more damage. Irish Water was a shambles from day 1. The most hated Quango that ever existed. Thats what cronyism get you ….. useless ‘shower’ of ‘drips’! He’s reminding me more and more of The Black Knight from Monty Python’s Holy Grail. No, I wouldn’t agree with that statement. No they don’t. I’m very happy with my pants. Look, my pants are exactly how I expected them to be at this point & I’m very happy. You can just shut up or get out to be frank. …as Kelly says, the Central Statistics Office is an independant agency. Any attempt by him to subvert it’s work would undermine the agency and the people who work there. This may be a silly question… but I wear my ignorance on my sleeve….. When, and it is a ‘when’…. when IW is protected under the Constitution from privatisation, can it still be off the balance sheet and independent enough to meet Eurostat requirements? Imagine the govt bought some Microsoft shares. And then put in rule saying they can never sell it. Same basic idea (reality more complex though). I think so. I think It is sufficient that it passes the market/non-market test. That’s not easily summed up; there is a flow chart on page 19 of the <a href="http://ec.europa.eu/eurostat/documents/3859598/5937189/KS-GQ-14-010-EN.PDF/&quot; Eurostat Manual on Government Deficit and Debt which gives an overview. My understanding is, a company can be “Publicly owned”, but not end up in the “Government Sector” : The list of objections from Eurostat can be split into those which show IW is “Publicly Owned” and those which show “given there is Public ownership, IW belongs to the government sector”. Putting IW in the constitution would be (in my view) a surefire way to ensure it always remains Publicly owned, as if anything it would copper fasten government protections. But provided it passes the market test, i.e. sets “economically significant” prices it, can go off the government balance sheet. The test itself is not set in stone, Eurostat regularly (although not with great frequency) updates its rules, the last time they did this was in 2010, although the rules only came into force in the last quarter of last year (the update before that was in 1995, the next update is scheduled for 2025). The idea of updating the rules is to add clarity for example, in moving from the 1995 version of the rules to the 2010 version, the “Other Financial intermediary ” sector of the economy was further broken into sub-sectors as this sector had grown very large and there wasn’t anyway of making it less opaque for national accountancy purposes. Another reason is when creative accounting eventually subverts the spirit of the rule, an example here would be the growth of “Brass Plate” headquarters, which are located for example in Ireland or Malta or somewhere for tax or other regulatory purposes, but all of their actual economic activity takes place in another country, even perhaps the decision making is made in another country. Under the 1995 version of the rules it was quite hard to know in which to record the value added (i.e. the contribution to GDP) of this company. A third reason to update the rules is because in their current form certain entities always switch between sectors depending on how profitable they are or a change of ownership structure etc. Eurostat would like accurate and stable figures and would consider rule changes which would lead to less erratic revision prone data. If Eurostat thought Ireland (and other countries) were playing too much with the market/non-market test or if they saw that corporations like IW sometimes pass and sometimes fail it they might change the rule. no worries, sorry about the terrible html skills. 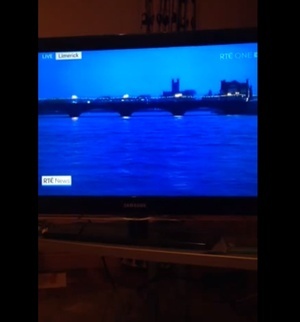 Alan Kelly…. I really don’t like him, I don’t believe a word he says, he reminds me of the worst of the FF stroke politicians. A mock up of that has got to be the cover of next week’s Phoenix surely? the sad thing is how institutionally neo liberal the EU has become.many people on the left now see it as the enemy. The EU is certainly trying its hardest to be the enemy, what with TTP, TTIP TiSA and that other one(?) coming down the line…. the end of democracy basically, or what is left of it. Whereas many people on the right? The weak attempts at spinning this fiasco are insulting these people have no shame. Let’s not forget that Sinister Kelly’s brother Declan is a the boss of Teneo Holdings a company with links to those lovely people the Clintons, and (of course) the CIA.